After months of negotiations, one of the biggest domestic fights of the year has been signed and sealed. 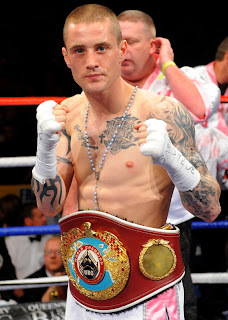 Two-weight World Champion, Ricky Burns will fight fellow British Lightweight, Kevin Mitchell. The fight will take place in Scotland, but no venue has been confirmed as of yet, and the 22nd of September is the date the two will meet in the ring. No announcement has yet been made for the under-card, but I think the winner of this Friday's fight between John Simpson and Paul Appleby will feature on the bill, as well as Scottish Cruiserweight Stephen Simmons. I think Burns/Mitchell is almost a 50/50 fight, I give the slight edge to Burns because he looked very impressive against Michael Katsidis and Paulus Moses, while Mitchell didn't look as good against Felix Lora. I think Burns will win a 116/112 type of decision, but it really wouldn't surprise me that much if Mitchell won a close points decision. I don't think they will be a knock-out in this fight, both fighters have good chins and a good defence. I think this is last chance saloon for Mitchell, he is only 27 but he has been a pro since he was 18 years old and has been in some tough fights. For Burns this is a defining fight for him, in this fight we will well and truly find out whether or not Burns is an elite level fighter. Finally, I think some credit has to go to promoter Frank Warren. Warren (rightfully) get's a lot of stick for his poor matchmaking, but he has made the two biggest domestic fights of the year in Dereck Chisora Vs David Haye and Ricky Burns Vs Kevin Mitchell. Ricky Burns Vs Kevin Mitchell - Vote on the poll to the right of this page to tell us who you think will win.